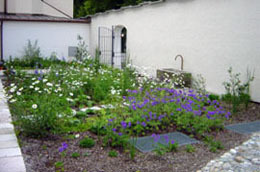 In 2001, the new educational center and guest house, the Kapuzinerhof, of the Academy for Nature Conservation was opened. Here, the ANL hosts the most of its lectures and events. External event coordinators can a rent these meeting and guest rooms. 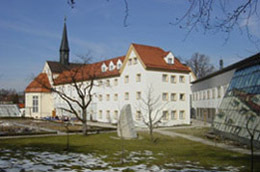 As an annex to the renovated former Capuchin monastery, a new building in the form of a glass house was designed. The seminar area can be found on the ground floor. This seminar area contains six bright and friendly rooms of different sizes and all of them are equipped with modern technology. Participants will find a pleasant atmosphere for conversation or relaxation in the spacious foyer of the conservatory and the newly designed monastery garden. Up to 100 people can sit in the large lecture room and, if needed, this room is divisible by sliding walls. 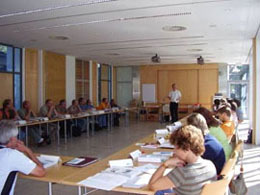 The event participants can hold discussions in small groups in the four smaller available neighboring rooms. For IT education, a computer lab with 12 workstations is available.